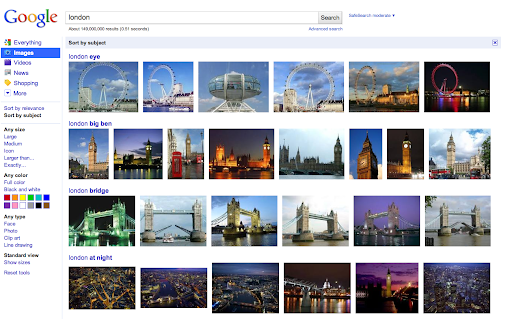 When you search for [london], by default you’ll see image results ranked by relevance. Click on “Sort by subject” in the left-hand panel and you’ll see images organized into categories that will narrow down your search and help you find the exact image of London that you want. Sorting by subject shows that some of the most popular images associated with London are the London Eye, Big Ben, Tower Bridge and the city at night. This organized view helps you find the images you were visualizing more quickly, so you might realize, “Ah, that big clock tower is called Big Ben, that’s what I was looking for.” You can then can click on the Big Ben group to find the best image within that subject group. Sorting will be rolling out globally to nearly every domain and language over the next week. Whether you have a particular image in mind or you’re just exploring a general topic, sort by subject can help you find the image you need—even if you don’t have the exact words to describe it. When you’re searching for images, sometimes it can be hard to come up with exactly the right words to describe what you have in mind. For example, when you think of London, you might picture the iconic clock tower or the big Ferris wheel. You may not always remember the names of those landmarks, but you can visualize them in your mind. To make it easier for you to find images in situations like these, you can now use Google Images with sorting.